The local property sector is expected to register a steady 10% growth in value this year and there is no threat of a property bubble, according to Malaysian Institute of Estate Agents (MIEA) president Siva Shanker. “We are expecting a nice steady growth of 10% maybe 12% or 13% if we are lucky. 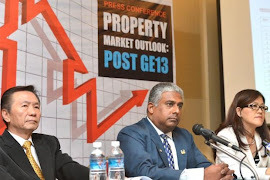 The growth won’t echo the phenomenal growth of about 30% like we did previously,” Siva said in a Property Market Outlook: Post GE13 briefing yesterday. He explained that the property sector was relatively slow in the first few months of the year due to the uncertainty of the General Election. “As soon as the election was over, there was a frenzy of activities in the sector. There were pent up demand in the first few months,” Siva said, adding that the market is “playing catch up now”. In addition, he said there were no indication that prices would trend downwards. Siva said there were also a changing trend whereby multifunctional property where one can work, play and live in the same area is in demand now. “Gated and guarded property is the in thing now and it will be a hard sell for developer if they don’t provide this,” he added. Knight Frank Malaysia managing director Sarkunan Subramaniam noted that the Bank Negara has adopted proactive measures to ensure there is no property bubble in the country. He said the measures were put in place by the central bank to cool things down. Meanwhile, MIEA immediate past president Paul Nixon said of late many smaller and newer investors are investing in commercial properties by pooling their resources and making collective purchases. He said investments in commercial properties, are generally more expensive in comparison to residential properties. Paul noted that newer developments tend to take three to five years before commercial activity and occupancy reaches optimum levels.